Took a little bit of adjustment to get it properly snug so it didn't drift, but once adjusted correctly it barely moves. Does a good job keeping the mud off me. I'd buy it again. On a really muddy ride my back was evenly spotted with drops this fender missed. Ideal product wintery road conditions. keeps the snow and wet off . reasoable price and easy mount to any bike. This fender is easy to mount and thus easy to transfer between bikes. It is simple and lightweight. Fender was easy to put on. Does a satisfactory job keeping the water off the back side. Apparently the description failed to mention this is only for MTB and ATB wheels... it's not long enough for 700c or 29 wheels because it will still allow a rooster tail to hit the back of your helmet or a backpack which I use while commuting. It would have been perfect for a regular MTB, clamping mechanism is secure and the allen bolt allows you to tighten the fender tightly. Depending on bike geometry and other factors, this rear fender can be used on a 700C (ISO 622) wheel. I've used it successfully and have seen it on other bikes around town here in Portland, OR. It might take some adjusting to catch all the the spray which might otherwise reach you, but it can usually be done. A full coverage fender will always provide better protection and help to keep you dry and comfortable in bad weather. Planet Bike's Cascadia Fenders are a great choice. Muliple Use Fender, Presto Chango from one bike to another! Bought one of these to use on my hardtail MTB. Saved me from the dreaded skunk strip several times. Then I went to visit my son and could not take my bike, so I planned on riding his in the rain. Quick disconnect works great, one snap and it is on or off. I took the fender along and re-mounted it on his MTB for use while I was at his house. Decided to leave it with him, as he did not have a fender. Came home and ordered 2 more, a replacement for me and a gift for my other son. Now all 3 of us have this excellent rear fender on our MTBs. It would work equally well on a road bike with the seat post mounting strap. Easy and durable with a pocket friendly price! 1. Wider than normal fenders, great for road, mtn, or cross tires. 3. I can switch this fender between all my bikes within seconds! Adjusts super easy to fit just about any seatpost. Like many others, I have multiple bikes and sometimes would rather take the mtn bike to work rather than commuter. Boom, three seconds and the SKS is moved from the commuter to mtn bike. 4. Very durable. Pliable, so wont crack or break easily. Practical, light weight and easy to put or or take off. I bought the fender for my road bike and after one use in a good rain my back was sprayed as much as ever, the fender is not long enough. I liked the idea of the easy attachment, but of it doesn't work, I could have attached a piece of poo for free and got the same results. 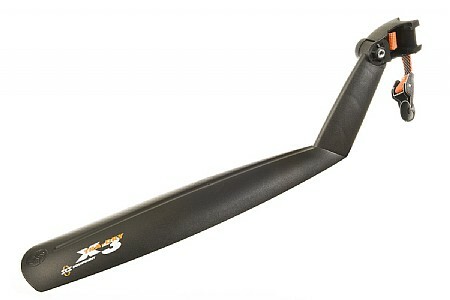 Don't even hesitate to buy this rear fender, it installs easy & works great!!! I was tired of scrubbing the dirt out of my expensive riding shorts and jerseys after only a few small puddles on the trail left a line of muck up my back. I thought I would try this fender and I am so glad I did. It went on to the seat post in about 1 minute. It stayed in place for a 15 mile single track ride. I hit some pretty muddy spots on the trail and when I got home my clothes were as clean as when I left, not counting the sweat. For under $15 you need to have one of these ready to throw on your bike when the trail is not going to be completely dry. I got this fender so I could quickly attach it and detach it without issue and it fits in my sling bag if I ever lock my bike up in the city. I think I paid $14 for it and that's totally worth it to keep your behind dry while riding in the rain! Easy to put on and take off, good for those days when there are wet stretches or the occasional shower. I use it on my road bike for wet winter rides. It performs as you would expect it too. Yes, I have a fully-fendered bike that is supposed to be my bike whenever it's raining... but sometimes it rains on your race-pace ride, or on your mountain bike ride-- and whichever bike you're pulling out of the garage, this can clip to your seatpost or seatmast in seconds and protect you all day from street-bidet.